a) There is summarising not only at the end of each session, but at appropriate intervals – this is excellent as we participants need this positive reinforcement for our learning. b) Notes sent to participants promptly. The notes are clear and succinct, and help tremendously for us to revise our learning. 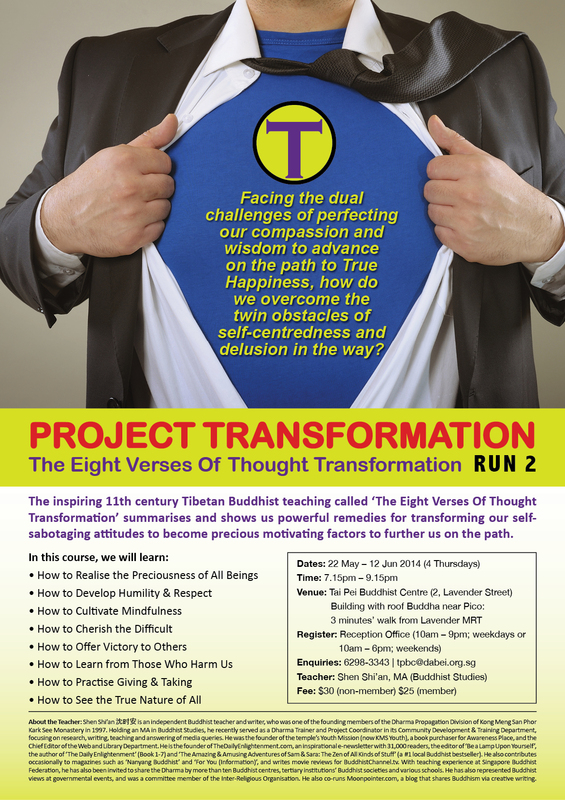 c) The initiative to print ‘The Eight Verses of Thought Transformation’ is great! We now read these verses after our nightly Nianfo sessions at home and feel that they are indeed useful and helpful in our daily lives. He also co-runs Moonpointer.com, which is a community blog that promotes creative sharing of Buddhism via thousands of articles. He can be reached at tde <at> thedailyenlightenment.com for invitations to share the Dharma via articles and talks. As the staff might be busy, you might want to make a call using the number in the poster above?